Daiwa’s new M-One features a stainless steel outer palming ring that has an ultra smooth titanium nitride finish to make it resistant to scratches. It also has a beefed-up seven-disc drag system. 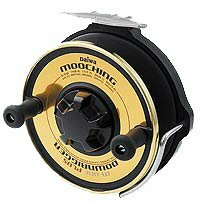 The Daiwa M-One has been around for quite some time which is a bit unusual for a Daiwa reel. This manufacturer, perhaps more than any other, has tended to constantly produce a range of new models – almost every year! The M-One is a salmon mooching reel. 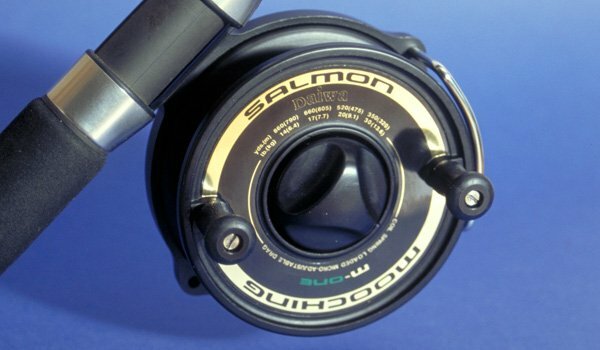 In Canada and on the west coast of the United States mooching reels are used to fish for the different salmon species in both fresh and saltwater. The salmon in this part of the world often grow much heavier than those caught in New Zealand. The method of fishing in these countries is to spool up with 40 – 60-pound mono and either troll a lure behind a boat or otherwise “lob cast” a sinker, baited hook, or flies over the side allowing the weight to pull line from the reel. A short cast, of sorts, can be made well enough with the Daiwa M-One for salmon, as this fish will often be either at the bottom of a hole in the river or down close to the riverbed in faster flowing water. The M-One is also used by some anglers who target Canada ‘s huge native white sturgeon. This species is the largest freshwater fish in Canada. Its recognized traditional home is the Columbia and Snake Rivers. Incredibly, white sturgeon can live for over 100 years, grow to 20 feet long, and can weigh over 1500 pounds. Understandably to catch a white sturgeon you need a super tough reel that can hold plenty of line and most importantly of all has a powerful drag system. Daiwa’s new M-One Plus features a stainless steel outer palming ring that has an ultra smooth titanium nitride finish to make it resistant to scratches. It also has a beefed-up seven-disc drag system. 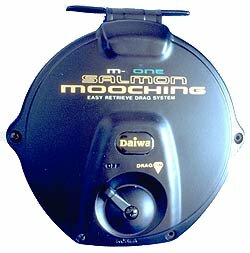 The Daiwa M-One is used in the South Island of New Zealand by salmon anglers fishing the big east coast river mouths for both Chinook salmon and sea-run brown trout. Here a fly is cast across the gut with the aid of a barrel sinker and is retrieved by mending line much as one would with traditional fly fishing gear. 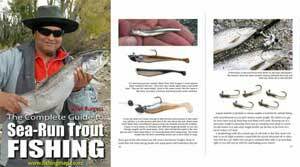 The difference is that the line is 40 – 60-pound mono and the barrel sinker is needed both to cast the monofilament line, and to pull the feathered lure, or lures, down to where the salmon will be holding close to the bottom. A soft action rod of about ten feet in length is swirled once behind the angler to launch the sinker forward. This method of fishing is known here as using a Canterbury Lure rod! It is quite specialized and obviously requires a good deal more space than is needed to fish with a bait-caster! A big salmon, or large sea trout, hooked in the fast, rushing water of the gut takes a fair bit of stopping and it is here that the Daiwa M-One comes into its own. Everything about this reel is designed to bring big fish to the bank. The one-way power drag system lets you wind forward without fighting drag resistance. 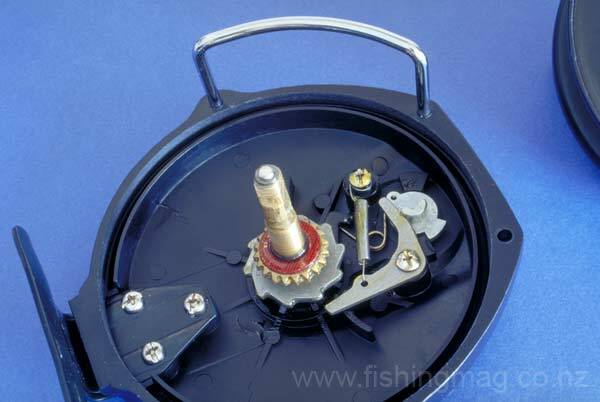 It automatically shifts into smooth, fish controlling drag as the line is pulled from the reel. When a salmon strikes, the typical method is to quickly raise the rod tip high into the air and then use the palm of your right hand to apply extra resistance to the edge of the spool. This is usually followed by running in the direction the fish is headed – mostly back out to sea! If you are left-handed the M-One can be changed around to suit without the need to buy extra parts. 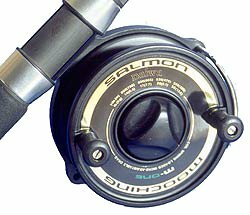 Line capacity is 14/860, 17/660, 20/520 but as mentioned most anglers who use this reel for salmon would spool up with several hundred metres of 40 – 60-pound monofilament. Recently Daiwa has released an updated version called the M-One Plus. This is essentially the same reel with a beefed up drag now featuring seven discs for even greater fish stopping power. A new refinement on this later model is the addition of a smooth stainless steel outer ring on the spool to provide a better palming surface. These improvements have slightly increased the reel’s weight to 17 ounces. The Daiwa M-One is a popular reel among Canterbury salmon anglers fishing the Lure Rod. It has a solid history of proven reliability. Highly recommended.